Special Valentine’s Day Beauty Giveaway from Bestselling Author Brenda Novak! This post is sponsored by Brenda Novak. 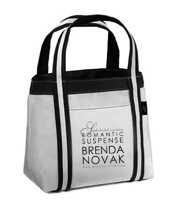 To celebrate Valentine’s Day, Cupid’s Pulse has teamed up with New York Times bestselling author Brenda Novak to offer a Brenda Novak canvas tote to TWO LUCKY READERS! But don’t think you’re getting just the tote bag; included are Novak makeup bags with THREE lip glosses named after her HEAT triology (retail price: $21 each) and an autographed set of all three books! To enter, tell us your next lip gloss-worthy occasion – whether it’s a steamy first date or a cool and comfortable night with you beau. The best answer wins! Please be sure to use your real email address so we have a way of contacting you if you’ve won – don’t worry, your address won’t be shown and we will never spam you. This giveaway will run until 11:59 PM EST on Thursday, Feb. 17. Check back on Friday, Feb. 18 at 10 AM EST for a post announcing the winners. Good luck! In the meantime, check our Brenda Novak’s special Valentine’s Day guest post: 10 Tips To Keeping Your Valentine. For more information, visit her website at www.BrendaNovak.com and follow her on Twitter: @Brenda_Novak.